I recently read an article written my mother on the most prominent historical figure of ancient Guam Chief Kepuha. A statue of his image stands in a very visible area in the capital city of Hatgatna. He was known as a powerful leader of the Chamorro people who embraced the Catholic faith of the conquering Spanish, and as you can read by my mother’s article below, he was seen as a man of faith and as a hero. Of course, through the filter of a very biased view of history that favors the western version of events and the dominant society, Kepuha is seen as a stellar example. However, on flipping the picture to the native point of view a different image appears that is not as flattering. The Spanish set foot on Guam with arrival of Ferdinand Magellan in 1521. From that point on, the Spanish held Guam until it ceded it the United States at the end of the Spanish American War in 1898. Like many other areas, Spain force fed their culture and their religion to the native population of Guam and its neighboring Mariana Islands. Along with the cultural onslaught was the wave of European diseases that virtually wiped out almost all of Guam’s Chamorro people. There was resisitance and violence by pockets of the native population. Two of the most prominent rebel chiefs were Matapang and Hirao. They resisted the foreign attempts on overturning their culture and way of life. Later both men were vilified for killing the missionary priest, Padre Diego Luis de San Vitores. He and a lay clergy men were sought after by the two chiefs, after they baptized one of Matapnag’s children without his permission. Many of the natives were afraid of the holy water used because of the disease brought by the Europeans. I don’t know the full story and I was not there. However, I believe that Matapang and Hirao have been judged too harshly. They seem to be men defending their lands and homes against foreign and religious incursion. Padre San Vitores was beatified bY the Roman Catholic Church a few years ago which is the final step to receive sainthood. Chief Kepuha, on the other hand, chose to accept the foreign ways. The original culture of Guam was made secondary, as Chamorros were integrated into the predominated culture of the time. This pattern still exists today. Perhaps, I judge him too harshly. I did not know him or his heart. However, I only wish that besides Kepuha, Chiefs like Matapang and Hirao should also be respected and bought into our cultural consciousness. They stood up for a culture that many of us want so much to keep alive today. Chief Kepuha is neither Hero nor Traitor. He was a man put into extraordinary circumstances and acted according to his faith. Ask Joyce: What is so important about the statue at the loop in Agana? The statue is Chief Kepuha or Quipuha, a great Chamorro chief in the 1600s. To the Chamorros, Chief Quipuha represented their ancestors, their struggles against the conquerors and the evolution of change to life on Guam. His statue at the loop in downtown Agana (Hagåtña) just before you get to Chamorro Village serves as a reminder of this Chamorro leader of the past. Chief Kepuha was the stately Chamorro chief of Hagåtña in the 1600s. 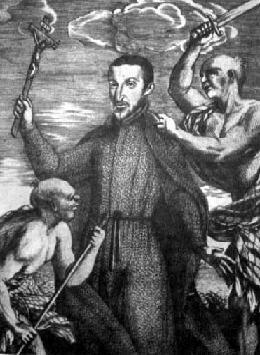 In those days, Padre Diego Luis de San Vitores was establishing the Catholic faith on the Chamorros. Many Chamorros accepted this new faith and were baptized, but some were not interested. Two powerful chiefs,Chief Mata’pang of Tumon and Chief Hurao, plotted to kill Padre San Vitores and his Filipino assistant, Pedro Calansor. This was brought about when Padre San Vitores baptized Chief Matapang’s daughter without his approval. Mata’pang was so angry. The two chiefs pursued with vengeance and murdered Padre San Vitoresand his assistant Pedro. This took place near the ocean at the backside of the Top of the Reef. The stories handed down from one generation to another told of the ocean turning red on the day the murder. On the other hand, Chief Quipuha, a few years before Padre San Vitores was murdered, pursued and learned the Catholic faith. He was baptized by Padre San Vitores and became Juan Kepuha. Juan welcomed the missionaries, zealously led his people in embracing the new faith and gained prominence in Hagåtña. He became Guam’s first Catholic chief. As a high-ranking male back then, he had the authority to hand down decisions, but only with the advice and consent of the highest woman in his clan, known as the maga’haga. The Chamorro women have the final say on any issues on the island and in the home. As Guam’s first Catholic chief, Juan remained faithful, but worked closely with the maga’haga. So in 1669, Chief Juan Kepuha donated a large plot of land in Hagåtña to the Catholic Church. The Dulce Nombre de Maria Catedral-Basilica as you see it today was built on this land. Juan ensured the Spanish had a strong foothold in the Marianas. He died in 1669, respected and revered as a great Chamorro leader. Padre San Vitores had the Chief’s body buried on the site of the Basilica against the wishes of a group of Chamorros to have the Chief’s body buried traditionally. 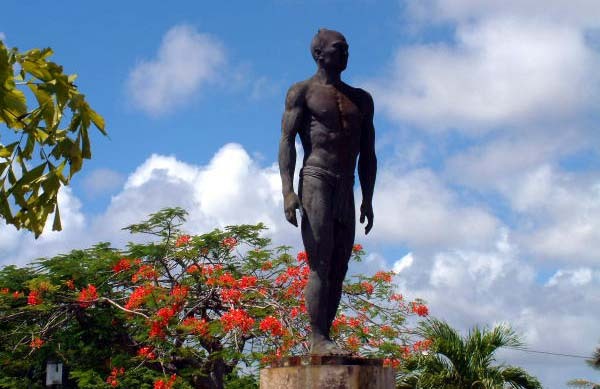 The statue at Hagåtñå represents a great Chamorro warrior, respected and faithful leader.